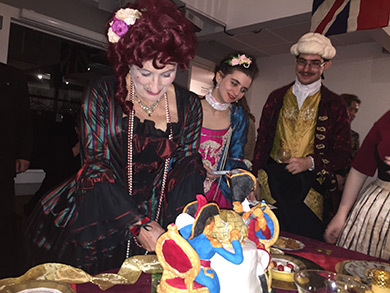 Followers of my Facebook and Twitter feed will have already seen me dress up like it’s 1799 and having fun at the Georgian Dining Academy. I thought that a blog to explain all of this would be appropriate. About a year ago, my friends Miss B and Kitty Pridden (in photo with me) set up the Georgian Dining Academy. 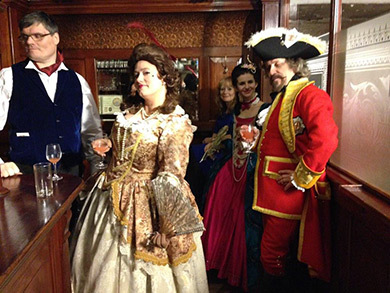 The best way to explain it is to call it an evening of historical dinner theatre, whereby our hostesses teach about some of the social etiquette and information from the Georgian times (the 18th Century, or 1700s for those who are not sure). 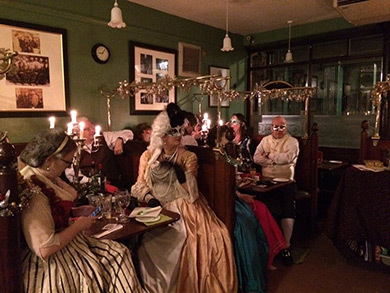 The venue has been a tavern in the City of London and the food has been extraordinary. The first GDA, I was the only one dressed in Georgian attire apart from our hostesses. My choice was a bold yellow dress with purple accents -- I loved it! Since its inaugural evening, gradually others are joining me in choice evening attire. On the first evening, I volunteered to sing a song from the era -- Amazing Grace -- which was written by John Newton who was a vicar only a stone’s throw away at St. Mary Woolnoth. On the second GDA, Miss B and Kitty asked me to perform again, and I did accommodate with glee. Arriving as a brunette with red feather in hair, I belted out Amazing Grace again. For the third GDA, I was delighted to be asked to sing again, and overjoyed to have the back up of a violinist. My research and preparation of a Handel song “Silent Worship” (which was sung by Gwyneth Paltrow in the film Emma) and my rendition of the first American national anthem “Hail Columbia” seemed to go down well. With luck, the ladies will ask me to sing again, as I do love it! My character “Lady Amber of the Colonies” helps me to make no apologies for my nationality and encourages everyone to remember that times in the Georgian days of old are eventful --- what with the New World being ripped into two as the Americans decide to part with parental Britannia. Lady Amber can also be cheeky and brash, which is something I try not to be in real life. (She helped herself to someone’s dessert last time, and sat on the lap of a guest -- all in good jest of course!) 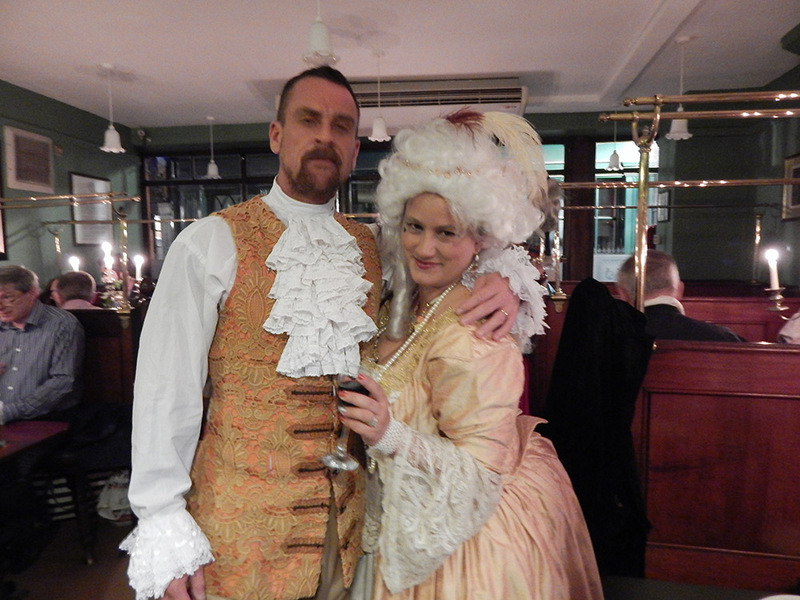 My first two events I rented costumes from Mad World Fancy Dress, but this last event I made my own. I now have a lovely dress that I can wear all the time -- so watch this space for a Georgian Walk in development. The beauty of London is that you can do things here that are so outrageous and one-of-a-kind. If you are looking for something fun and different to do, I can highly recommend the Georgian Dining Academy. The next event has just been announced for 17 September, and you can book by CLICKING HERE.